Katharine "Kitty" Parker (1886-1971) was born and raised near Longford in northern Tasmania. after early studies in Melbourne. she took lessons with the great Australian pianist Percy Grainger. Grainger’s estimation of Parker was that she was the best student he ever had and that her composing talents were second to none. In London Parker began composing in earnest and published songs and piano pieces from 1913 until the mid 1930s. Her music generally reflected the Edwardian tendencies of the time towards sentimentality, particularly in the songs but, with an individual persuasive emotional sensibility genuinely admired by Grainger . 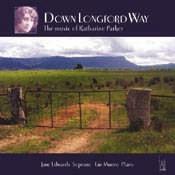 This CD, featuring Ian Munro (piano) and Jane Edwards (soprano) performing Kitty’s songs and piano music, was funded by the Tasmanian Bicentenary. What a catholic world we live in! ‘Catholic’ in the sense conjured by that PC word ‘inclusive’. There is room for a very wide variety of styles of ‘serious’ music. Not so many years ago the chances of this type of repertoire being recorded were slim. Now the world of recorded music is much more diverse and accommodating. Katharine Parker’s is a voice light and even sentimental from 1920s and 1930s Australia. She is obdurately indifferent to the second Viennese school. Her style is loosely linked with the lighter fare of Arthur Benjamin, Dulcie Holland, Miriam Hyde and Frank Hutchens; the repertoire satisfyingly explored by labels such as Tall Poppies, ABC and ArtWorks. Katharine "Kitty" Parker was a product of rural Tasmania in the Longford area. She studied in Melbourne and later with Percy Grainger for whom she had a life-long admiration. She was accepted as his pupil in London. Her presence in the Grainger circle put her in contact with Goossens, Scott, Quilter and Balfour Gardiner. Grainger praised her piano solo Down Longford Way and encouraged her to orchestrate the piece. She stumbled over this task and Grainger then himself made an orchestration (let’s hear it please). Most of her music dates from before 1930; a watershed year for her. It was at this time that her marriage to Hubert Eisdell, the English lyric tenor, ended. After many years in England and touring through Europe, she returned to Australia in 1947. She continued to take pupils and corresponded with Grainger. After her death, her son Michael Eisdell deposited her compositions at the Grainger Museum in Melbourne and at the ABC music library in Sydney. In fact her compositions in total only amount to about one hour of music, most of it recorded on this disc; the equivalent of one slender volume. A Water Colour is a lightly bejewelled sketch in the gentler pastoral manner of Ireland and Quilter. Nocturne reflects some of the Chopin heritage associated with the form however it is by no means a somnolent piece. The Four Musical Sketches are gentle genre pieces: a downy One Summer Day, a more passionate Patchwork of Shadows and an undulatingly rambling Red Admiral (no fast flight here). Finally comes her signature piece: Down Longford Way. No wonder Grainger loved the piece. At its heart is a melody heavy with sentiment with an affinity to Grainger’s own Colonial Song. Arc-en-Ciel has a distinct Gallic tinge - a grand salon waltz with storm in its contours and with Ravel in the wings. Brushing up the leaves doffs its hat to ragtime and could have been popular in the 1920s although it never made it with a publisher. The Six Songs are settings of Chinese poetry which at their best recall Rachmaninov’s romances and Gurney’s songs - or at least the serenading ones (e.g. All Night Under the Moon). These are fragile and sentimental stems inhabiting a ‘willow pattern’ world without overdoing the Chinoiserie. They inhabit much the same world as the rather soft-focus Chinese settings by Granville Bantock and John Alden Carpenter. The Three Japanese Love-Songs are endearing sentimental little poems and the fine Little Dwarf Tree injects some liveliness into an otherwise winsome - or even twee - landscape. The waltz song I don’t care goes with a warm swing and would still work well in concert if suitably orchestrated. I rather think this is the sort of song that Lord Berners lampooned in his own songs collected on Symposium. Ian Munro’s note is substantial and studded with factual detail rather than flowery generalisation. The note amounts to an extended encyclopaedia entry. The words for all the songs are given in the booklet. All too often discs appear with music of forgotten composers, and we emerge from listening thinking the neglect is well deserved. Katharine Parker (1886-1971) was born in Tasmania, earned her Diploma of Music in Melbourne, and then went to London hoping to study with Percy Grainger. She travelled widely, making her living primarily as a pianist, and wrote in all only about an hour's worth of music. This disc, then, would appear to contain almost all her output. Her style is certainly reminiscent of Grainger's — tonal, sumptuously harmonic, with a wonderful wistful sense — and many pieces are impressionist, sometimes veering toward elegant parlour music(and there is a jazz piece). So it is all derivative, but no matter because the music surprises and interests us, The songs are nice, though too often the piano doubles the voice and the style becomes sophisticated pop music. I generally prefer the piano pieces, which I think could be picked up by performers looking for new material in a light vein. The performer, both Australians, present the music in a wonderful light, and the disc comes with lengthy notes and texts, The music is accessible enough to yield up its secrets on first hearing, so lovers of early 20th Century British music should take notice. © Althouse. American Record Guide. Sept-Oct 2005. Yet another in Tall Poppies' admirable series devoted to the music of Australian composers, this compilation will bring to many a first experience of Katherine Parker's music. Ian Munro is an inspired choice as interpreter of Parker's piano music; he shapes to its demands like sparkling wine to a goblet. His interpretations are consistently communicative in the best sense. Listen to his account of A Water Colour, playing informed by a charm and expressiveness that radiate authority. So, too, Nocturne, which falls most agreeably on the ear. And in One Summer Day - from Four Musical Sketches - Munro clothes each note in glowing tone, no less so in Red Admiral with its gently rocking figurations. But in Down Longford Way - from which the compilation derives its title - the music, for all Munro's persuasiveness, sounds rather cliched, sentimental music in the tradition of the honeyed Home Sweet Home. Percy Grainger thought it a work of genius. But if DLW is something of a disappointment, Brushing up the Leaves is pure delight, an engagingly, up-tempo delight in the style of a fox trot. Arc-en-Ciel calls some of Chaminade's piano pieces to mind, a little gem in salon style. Soprano Jane Edwards is most persuasive in I wait my Lord, music infused by a melancholy, forsaken mood. But You've two-score, three-score years before you yet, has a robustly striding, march-like quality. Yellow's the Robe for Honour sounds rather lowset for a soprano. Of all the songs, it's the last three that provide most satisfying listening; each might have been purpose-written for Julie Andrews for some lightweight Broadway show. Sentimental in text and setting, they work very well on those terms - and Edwards rises well to the occasion. Here, and throughout, Munro is a near-perfect piano partner, loyal to both singer and composer whose accompaniments he plays with exquisite refinement and stylistic authority. Munro's liner notes, an engrossing read, tell us about a composer's life dogged by ill fortune, too many disappointments and serious illness: TB and goitre problems. Parker's total compositional output totals less than one hour's duration. Bouquets to the Tall Poppies team. It's ventures such as this that ensure that Australia's early music history is responsibly and imaginatively preserved.